Today’s Guest Author is listener Nicole Bamberger, who you have likely heard on the Mousetalgia Podcast, providing “Ears to the Ground” updates! Change up the digital wallpaper on your phone or computer to something with a more festive feel. The Disney Parks Blog offers quite a few wallpaper options. Boom, you’re done! It certainly doesn’t get much easier (or cheaper!) than that! 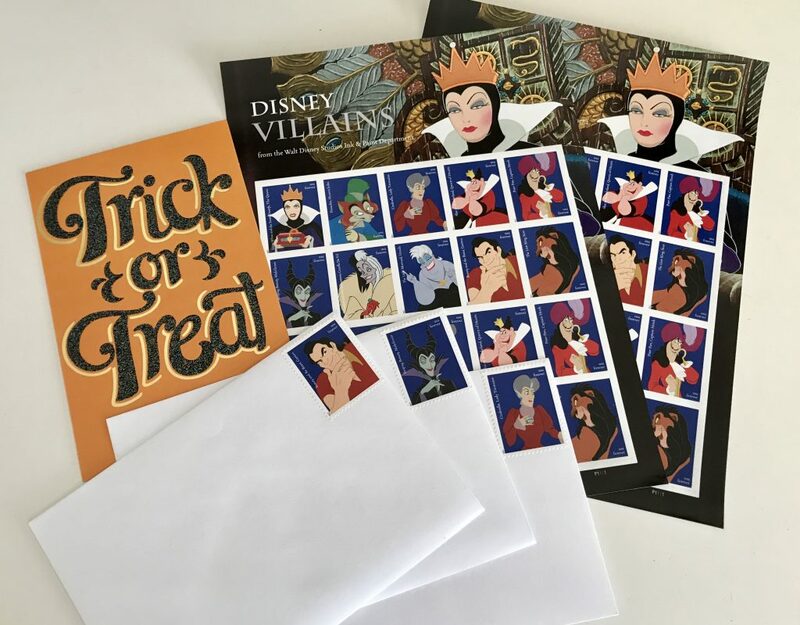 Send your mail this month using one of the new Disney Villains Forever stamps that were released by United States Postal Service earlier this year! (Sending physical mail is still a thing, right??) Pay all your bills online and don’t have anything to mail? Why not send a friend or family member a Halloween card? Sure, we tend to expect holiday cards during the wintertime, but a Halloween card is a rare and unexpected treat that’s sure to delight! A sheet of 20 stamps (featuring 10 different villains) will set you back $9.80. Time to get cozy for this one! Got your pajamas or comfy sweats on? Good! A few weeks ago, I had the opportunity to attend the Disneyana Swinging Wake Dinner, which took place on Saturday, September 30th, at the Disneyland Hotel. There were some great guest speakers, including Lucky and Wayne Gracey (sons of Disney Legend Yale Gracey), Alan Coats (son of Disney Legend Claude Coats, and an Imagineer in his own right), Garner Holt (the mastermind behind The Nightmare Before Christmas Haunted Mansion overlay), as well as other Haunted Mansion connoisseurs (including the one and only Chef Mayhem himself!). 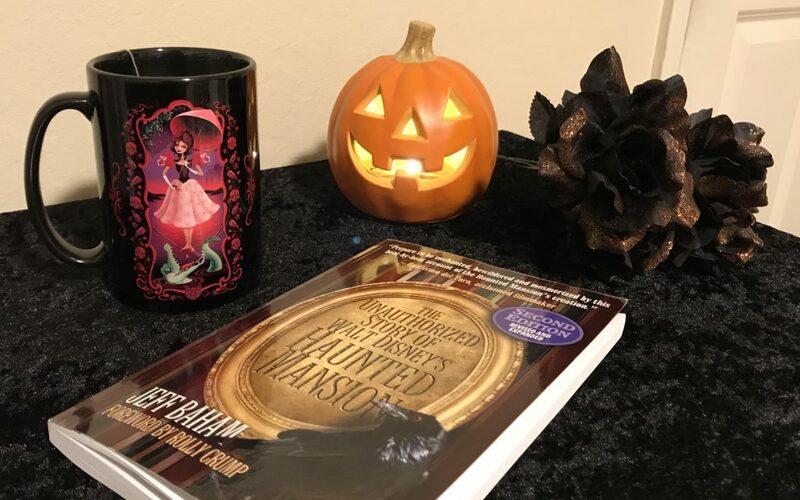 The event totally sparked my interest to learn more about the history and inner workings of Disney’s Haunted Mansion attraction, and therefore directly inspired the ideas here. Consider picking up a spooky read! Every October, I try to find a Halloween-themed read to enjoy. At the Swinging Wake event, I was finally able to snag a copy of Mousetalgia Jeff’s “The Unauthorized Story of Walt Disney’s Haunted Mansion”. While I’m only a few pages into this one, I really like it so far, and find it to be the perfect fit! Alternately, you can check out these books from Disney Publishing Worldwide: “The Haunted Mansion: Imagineering a Disney Classic” by Jason Surrell, or, for younger readers, “Tales from the Haunted Mansion: Volume I” and “Tales from the Haunted Mansion: Volume II” by Amicus Arcane, and “Disney Parks Presents: The Haunted Mansion”, which features the original attraction lyrics written by Disney Legend X Atencio. Pairs well with: A rainy day and a pumpkin spice latte/coffee/tea/apple cider/whatever your fall drink of choice! Similarly in terms of a relaxing (if not somewhat frightful) night in, you can listen to the original Disneyland soundtrack, “The Story and Song of the Haunted Mansion” over on Mouse Vinyl. 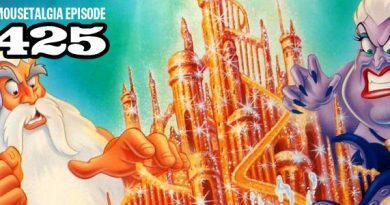 It’s a lovely auditory walkthrough of all the sights of this attraction– just close your eyes, and it’s almost like you’re there! Alternately, “Chilling, Thrilling Sounds of the Haunted House” and “The Legend of Sleepy Hollow and Rip Van Winkle”, both also over on Mouse Vinyl. Time to get carving! This one’s pretty straightforward. 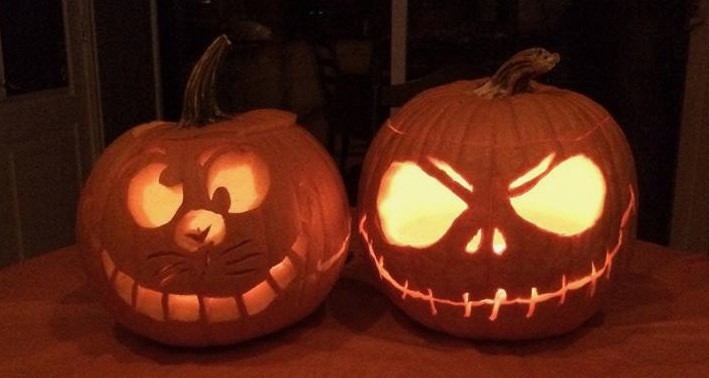 There are a ton of ideas online for how to make Disney themed Jack-o-lanterns and even creative ways to decorate pumpkins that don’t involve carving! My cousin drew the designs for these in a matter of minutes! Thank goodness someone in the family is artistically-inclined! 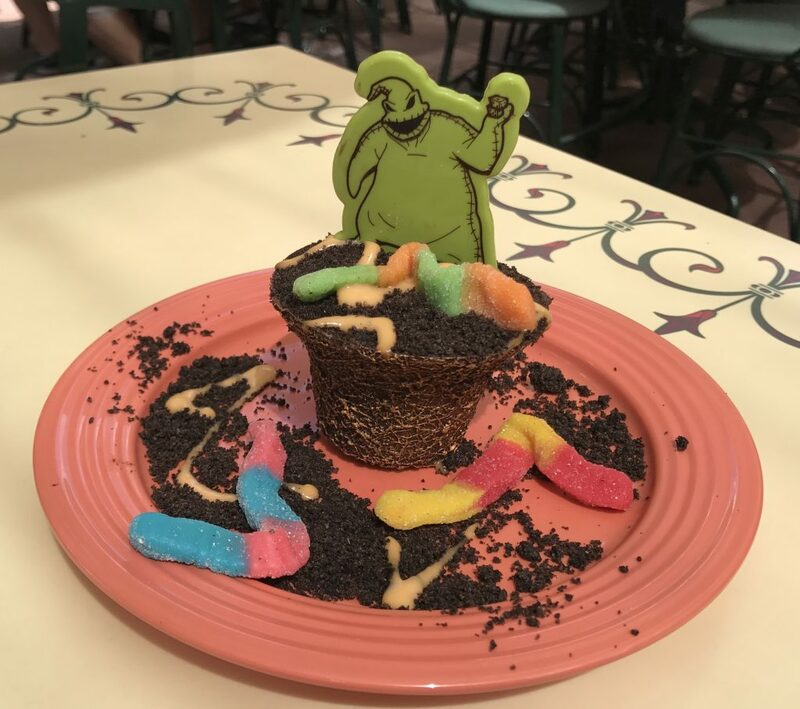 Or, maybe make a twist on this Oogie Boogie dessert currently available at the French Market in Disneyland. This one is more cake-based, but could easily be made at home as a “dirt cup” made of chocolate pudding, crushed Oreo cookies, and gummy worms. Looking for something a little different? No problem! Fortunately, there are plenty of other Disney and Pixar Halloween movies out there, such as Hocus Pocus, The Haunted Mansion, The Wonderful World of Disney Tower of Terror, Frankenweenie (the original and the Tim Burton version), the Disney Channel Original Movie Halloweentown, plus a whole slew of Halloween-y Disney cartoons and Pixar shorts. 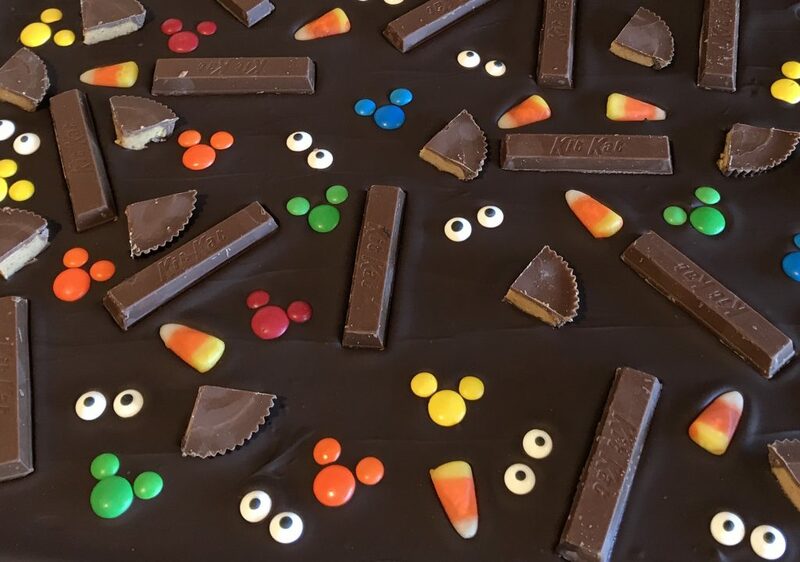 Another snack idea: try making this “Halloween Candy Bark”, and adding in a few Hidden Mickey’s! I made this last year, and not only was it a tasty hit, but it was super easy to make! I made it again this year, but this time I used a combination of regular and mini-size M&M’s to add in a few colorful Mickey’s. Turns out they’re the perfect size! Try to learn all of the words to “Grim Grinning Ghosts”, Ghost Host narration and all. Seriously, give it a try right now– no cheating! It’s hard, huh? This one is silly, and will take plenty of practice. Once you’ve got it down though, you’ll have a lifetime’s (and perhaps an afterliftetime’s) worth of skills to both impress and annoy anyone unfortunate enough to be standing near you in the Haunted Mansion queue. That’s it for now! Take care, and Carpe Kingdom! Do you try to incorporate Disney into your Halloween season? Comment below! This is so awesome, I am having some girlfriends over Saturday to get in touch wth out inner Halloweeeny side. We are definitely doing some of these fun ideas! I’m so happy to hear that! Hope you and your friends had a great time!